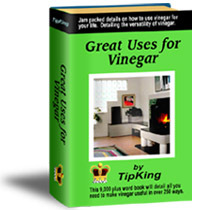 If you have stickers, price labels or decals that you want to remove reach for the vinegar. Vinegar actually eats away at the adhesive that holds these stickers on. For those no-slip decals on bathtubs, soak a cloth or sponge in vinegar and squeeze it over the decal or sticker. You can even use vinegar to remove glued-on wall hooks. Just make sure to dribble the vinegar behind the hook so it works its way into the adhesive. I hate the price tag or label that comes on new items that you buy. Usually you will find them on glass, wood, or china. These are no match for vinegar either. Brush on some vinegar, let it soak in for a few minutes, and then rub off the label. You will often find that the label just glides off the item.